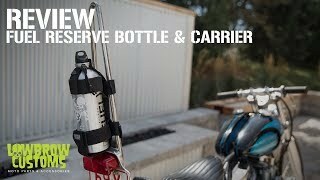 Increase the convenience of your Lowbrow Fuel Reserve Bottle by making it easy to stow on your bike for a quick jaunt around town or for a month on the road. This Fuel Reserve Bottle Holder is made of ballistic nylon and securely cradles your fuel bottle with two heavy-duty velcro straps and a cord closure at the top. Two more nylon and velcro straps are included and will affix your fuel reserve bottle securely to your front forks, sissy bar, or anywhere else you see fit. The prototype was tested on a cross-country, 3,000 mile jaunt with no issues at all, and came in handy multiple times. You can also buy a Lowbrow Customs Fuel Reserve Bottle and Carrier Combo as a set and save yourselves some dough! Holds up great at high speeds and rain lol fast prompt delivery. The bottle got here in time for me to complete an epic ride out to Kennedy meadows - at least 30 miles from any cell service and 60 miles from any fuel. Lowbrow ships fast and the product is just as described.